One of the best perks of working for the Mouse isn’t the free park access, benefits, or expertise and experience gained from working at the Walt Disney Company, but actually is the discounts! Yeah it may sound selfish, but let’s be honest, some of the best things about working for a great company are the perks. Whether if it’s getting super discounted Disney Cruises and hotel room rates or getting ridiculous holiday merchandise and restaurant discounts, you are guaranteed to save a lot of money just by flashing your company ID (blue ID). Below, you’ll find the complete listing of all the Disney Cast Member discounts you can take advantage of both on and off-property, as well as some that you can receive at other locations across the U.S. So with that being said, let’s get started! Here are all the locations where you can take advantage of a merchandise discount at Walt Disney World. This discount is usually 20% and applies to everything (including Pandora) except for the canvas paintings. Shop Disney Parks app: 20% off purchase using the app and adding your main gate to your profile. Directions can be found at the Hub. As a cast member you get a really hefty resort discount at Disney for both yourself and your friends and family. 50% off for Cast Members. You (the Cast Member) has to be staying in the room in order to get 50% off. 40% off for friends and family. You don’t have to stay in the room in order to get the discount. Up to 50% off at Aulani in Hawaii. To book this special offer for most nights in 2018 (blockouts include 6/8/18 – 8/25/18 and 12/22/18 – 12/31/18) call (866) 44-DISNEY (34763). Reduced rates: Rates vary per sailing and they only apply for select dates but if you catch it right you can get rooms for as low as $80 a night per person on 7 night Caribbean sailings. Just check on the Hub for more accurate pricing, sailing information, and to book your cruise using your discount. Cast Member and their friends and family get amazing discounts for almost all tours by Adventures by Disney. Block-out dates do apply. Check the Hub for more details. You can actually get cheap park tickets for your guests from any Company D location. This is a perfect option for anyone who doesn’t have (or want to use) any guest passes. Wild Africa Trek at Animal Kingdom: 50% off tickets for cast members after 11:30 am (regular price is $189). Must be booked 2 weeks in advance. Behind the Seeds at Epcot: Free. Must sign up at their desk by Soarin 20 minutes prior. Fishing: 15% off the regular price of the 2 hour excursion for the Guided Bass Fishing Excursions and Bass Nitro Fishing Excursions at select WDW marinas. Excursions include fishing equipment, rod, reel, shiners, artificial bait, non-alcoholic beverages and a 1 year membership to B.A.S.S (Bass Anglers Sportsman Society). Water Equipment at Sammy Duvall’s: 10% off the regular price of all activities including parasailing, water skiing, wakeboarding, and tubing trips at Sammy Duvall’s Water Sports Center located at Disney’s Contemporary Resort. With just your company ID, you’ll be able to take advantage of some great restaurant and dining discounts across many restaurants on Walt Disney World property including all resorts, parks, water parks, and more. But since there are some many cast member dining discounts to list, we went ahead and compiled them on a separate page that you can easily save or print for future references. Click here to Cast Member Dining Discounts. AMC Theater Tickets: $8 movie tickets after 4 pm. This can only be purchased at the box office and not online. Characters in Flight: $15 for adults and $10 for kids before 8 pm. Splitsville Bowling: $7 for one hour of bowling with shoes after 10 pm. 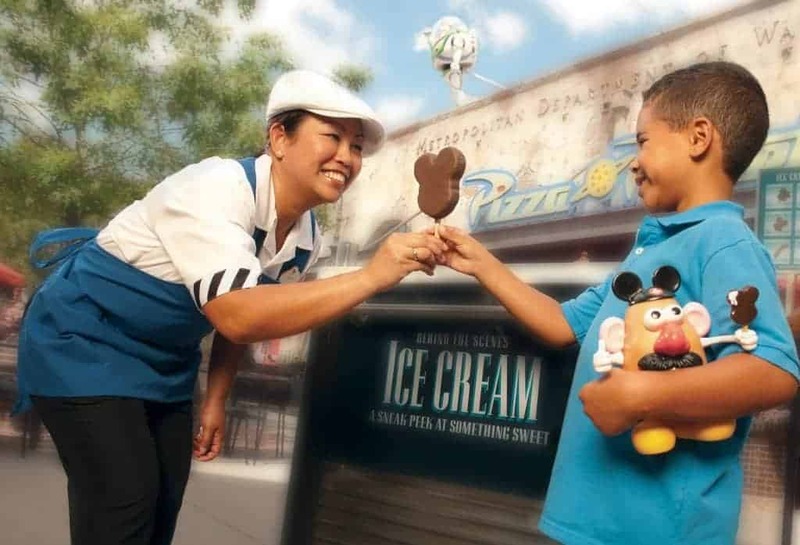 Ghirardelli: 20% off your purchase of any food, ice cream, and beverages. All Disney-owned merchandise locations: Get 20% off your purchase. Lego Store: 10% off your purchase. 50% off you and your guest for all 4 courses at Winter Summerland and Fantasia Gardens. Besides getting a 20% discount on food at the Boardwalk Bakery, Trattoria al Forno, and the Pizza Window, you also can get a discount at Jellyrolls. Get 15% off the non-discounted price of select 50 minute or longer spa or salon service for you and up to the number of persons in your package (hand and foot treatments excluded; age restrictions apply). For reservations and locations call 407-WDW-SPAS or 407-939-7727. Fairytale Weddings: special discount of up to 50% for your wedding. Must be booked years in advanced. Disney Honeymoon Registry: compliments registry setup and planning for couples planning a Disney honeymoon. Disney Floral and Gifts: 10% off for cast. Nike Outlet: Get 10% off your purchase when you show your company ID at checkout. Timberland Outlet: Get 20% off your purchase when you show your company ID at checkout. As a cast member you get access to discounted sporting event tickets for the Orlando Magic and Orlando City Soccer. Just be sure to visit Company D to buy tickets! Get discounted tickets for select Disney on Broadway shows including The Lion King and Aladdin! Tickets can be purchased by calling the Disney on Broadway Hotline, 866-870-2717, or by visiting the Minskoff or New Amsterdam theaters in New York City. Mention code 7DISEMP. Word of advice, avoid late March and early April and you’re blackout date free! Lockers at the parks: just show your company ID and you get free locker access. You just need to give them a small $5 deposit and you’ll get that back once you return your locker key. Wheelchairs: You can get a free wheel chair to use at the parks. All you need is you cast member ID. Be sure to share any of your favorite Disney World Cast Member discounts by leaving a comment below. Or you can reach out to us on Instagram (@adambryan). Are there any current restaurant discounts for employees? I noticed that the link on here said that the discounts were valid only until October. Also, do all of these discounts apply to ESPN employees. Lastly, what discounts have a blackout dates around Christmas? Are these discounts just for Cast Members in America, or can Cast Members from Paris and Tokyo etc use their ID to get discounts in WDW too? Well, I love icecream too! I forget to say that this is a good site bros! I see a tonnnn of spam comments lol. So I use to be a CM but now I’m currently a 3rd party discount info(green ID)? I know of a few already because I work at Disney springs but maybe you would know more? Would be great to explore! I love you blog in general so much information! cast members do not get up to 50% on disney weddings. this is incorrect information. You forgot to mention that Cast Members get 40% off during the holidays. Also, can you not delete all of the garbage comments left by brainless morons? I Just found on today that CiCi’s Pizza are no longer accepting both Resident and Disney Cast Members. The change want in effect yesterday and not sure if other places are doing this, but I get the feel that being close too certain other upcoming changes I believe that CiCi’s Pizza may not be only one. Free lockers are no longer offered to CMs. At some point Disney rented out their locker space to another company so they’re no longer owned by Disney and not eligible for a discount. So if I work at Disneyland in Anaheim, Ca do I still get all of these discounts if I take a vacation to Orlando?